Johanna picked me up from the airport and took me to her parent’s house. The whole time we were in the car together I could sense there was something unusual about her but I couldn’t quite put my finger on it, so I kept quiet. Her home was classically Icelandic, set on the coast with beautiful views of the Atlantic. It could be argued that even her family looked classically Icelandic, and with his white beard and knitted hat her father looked like a happy fisherman. They looked so different from Johanna that I wondered if she was adopted. In the car ride from the airport she had talked a lot about wanting to visit Cuba. I thought maybe that’s where she had been adopted from as a child and wanted to go back and visit. On the wall in the living room there was a picture of a beautiful, blond-haired, blue-eyed woman winning some kind of pageant. Johanna explained that it was her sister winning the Miss Iceland contest. I couldn’t keep it in any longer. I had to ask why she looked so different from her family. She laughed and told me that in Iceland everyone looks so similar that as a performer she needed a way to distinguish herself. She’d plucked her eyebrows into a thin arch and dyed both them and her hair jet-black. After looking at her closely I saw that underneath the hair and the deep tan there was a blue-eyed woman who looked just like her sister. I couldn’t believe that hair dye and a tan could change the way you look so dramatically! Most of Johanna’s friends were socialites too and they took me out bar-hopping nearly every night. It seemed that part of the fun for them was to “see and be seen.” It was a time of year when the sun never really set so we would stay out until 4am each morning and then crash on someone’s couch or in their garage. It was my first true CouchSurfing experience with people I didn’t already know. In addition to the Icelandic nightlife I saw hot-springs and volcanoes, but one of the most rewarding things was being able to give Johanna and her friends a very American experience. Near the city of Reykjavik was an American air base with a fast-food restaurant called Wendy’s that apparently served the best burgers around. Wendy’s is a well-known chain in the US but since I’ve been vegetarian all my life, I had no way of knowing if that were true. Johanna and her friends assumed that because I was American I would automatically be allowed onto the base even though they were not. I knew my nationality probably wouldn’t give me any privileges at all, but we decided to try. They really wanted to try those burgers though, so when one day there was a helicopter show on the airbase, we hatched a plan. We rode up to the side gate, our car packed full. In as relaxed a manner as I could manage, I told the guard that we were there to see the air show. He told us we would have to use another gate around the corner. That wouldn’t work because that entrance and the airshow were separated off from the the rest of the base. If we went through that gate we wouldn’t be able to get to Wendy’s. I was frozen. We’d come this far, I didn’t want to disappoint my new friends by just turning around and going home. After staring blankly at the guard for a few seconds, I asked, to the shock of everyone in the car, “Uhhh, how about we just go to Wendy’s instead?” To our relief, he laughed. “OK,” he said, “just don’t let anyone know I let you in.” In my mind it was a funny thing to want to do, go to a fast-food restaurant, but I was happy because, in a weird kind of way, it was like I was showing my hosts a little of my own country. The Icelandic students had proven me right. My idea for a website that connected travelers with people who were willing, eager even, to host them, was going to work. The important lesson though was that this had worked because both my potential hosts and I had made an effort to describe ourselves before meeting in person. We talked about ourselves in such detail that when Johanna and I eventually met we weren’t like strangers at all. We had not only established trust, but we had established that we found each other interesting enough to bother meeting. The website needed to do the same. It needed to go beyond the basics of name, age and occupation. It needed to ask people questions that probed deeply enough to discover what was really interesting about them. The site needed to be a social network that helped people share who they really were with people hundreds of miles away. This trip inspired the questions that you see asked on each profile on the website today. Which of them do you find most useful in choosing who you would most like to host or surf with? Are there any other questions you think we should ask; any other information you would like to see? Spamming Bjork – can I stay on your couch? In the year 2000 I had the opportunity to travel to Iceland for a long weekend. I knew I wanted to build a website, and that it would connect travelers with local residents who were willing to host them. But, I didn’t know what that website would look like or if it was even something people would be interested in. I knew from experience that people could be open to hosting someone they had met socially, even if they hadn’t know them very long, but to host a stranger off the Internet? I didn’t know about that. I was about to get the perfect opportunity to experiment. I found an off-season ticket to Reykjavik on a Monday that was a bargain-price if you could leave Friday and return Monday. Iceland was always somewhere I had wanted to go. I love rugged and unique landscapes, particularly those in northern climates, and flying there suddenly for a long weekend seemed like fantastic adventure. At the time Iceland was the second most expensive country in the world and even hostels were more than I could afford. I definitely needed to see if I could stay with someone for free and discover once and for all how to make CouchSurfing possible. I didn’t know where to start trying to find someone to ask if I could stay on their couch. I tried Googling “Icelandic website” and contacting the owners of the sites. I wrote a nice email introducing myself, telling them that I would love to come to Iceland and stay on their couch. I can’t imagine what they thought of a young American man randomly emailing them and asking to stay on their couch, but needless to say, by Wednesday I had received zero responses. In another search I stumbled across a student directory for the University of Iceland. After a little digging I figured out that if you could search for people’s email addresses by either their first or last name. I think this would be a privacy issue today! So, I had found a way to get in touch with people, but the question was “who?” I didn’t know any Icelandic names… but, then I realized, “Björk”! She’s famous, she’s Icelandic. It’s worth a shot. Sure enough, there were a handful of women with the same name. Then I was really on a roll because as I looked at the last names in the list, a pattern emerged. I did some research and I learned Icelandic people take their last name from the first name of their father. So, for example, the son of a man named Ísar would have the last name Ísarsson, and the daughter the last name Ísardóttir. Once I understood this, every time I saw a new last name I would take the first part of it and plug it into the search again. I repeated this process until In the end I had gathered about 1,500 names and email addresses. I thought that maybe part of the reason I had been unsuccessful with the website owners was because I hadn’t made my emails personal enough. I had to make a more personal connection this time to give myself any chance of receiving some responses, and not be dismissed as spam. I knew I had to seem not only trustworthy but interesting enough to bother meeting. If there was any way to know anything about these people, I would have written individual messages. But all I had was their names — I had no idea who they were or what they were interested in. So I had to do my best with what I had. I created a mail merge to make sure that each email used the person’s name. Then I wrote all about myself: where I was from, what I did for a living, what I was hoping to see in Iceland and links back to my own website so they could see what I looked like. I did everything I could to make make the letter seem as personal as possible. I even made sure to use their name at the beginning and end of the letter in the hope of making a better connection somehow. All 1,500 were sent in a matter of minutes. All I could do was sit back and hope for the best. After a couple of hours responses started coming in, and they ranged from ordinary invites to hang out and get a beer, to staying in a house made of volcanic rock, and drinking vodka in the nearby hot springs. I was excited because people seemed very eager to offer up ideas of what we could do together and to open up their homes to me. Now I had the opposite problem. Too many awesome opportunities to choose from. But, it had worked! My experiment had shown me that there were people who were more than willing to host a traveler they had never met, they were really happy to do it. The idea could obviously appeal to hosts as much as it did to travelers. It seemed as long as you put the effort in to fully describe yourself and show yourself to be a sound and interesting person, then people were eager and excited by the prospect of meeting you. At a time when it was considered dangerous for Westerners to visit Egypt, I traveled there and had a truly life-changing experience. One evening I was welcomed, along with a friend, into the home of a woman and her three daughters. We didn’t know them, they didn’t know us, and we couldn’t speak the same language. Yet, they fed and entertained us, and gave us somewhere to sleep. Why did they do that? Why did we trust them? If everything we’re taught to believe about ‘other’ people is true, we should have feared each other for our differences. Instead, we ate and and took shelter together. I got to see an Egypt I would never have otherwise seen, and to meet people I would never have otherwise met. The experience showed me that people are naturally curious, and that if we provide them with the right tools, they’ll actively seek to meet those different from themselves. Two years ago we wrote out a very specific vision statement. I’ve seen it in action, and I believe it’s powerful and speaks clearly to what we’re aiming for as a community at Couchsurfing. Our vision says we want people to explore, connect and have inspiring experiences, and that we believe this will help create a better world. An inspiring experience is fun, or “magnetic,” but also provides the opportunity for personal growth. Sharing an experience with someone who is similar to you might be magnetic, but does it challenge you or help you grow? What about sharing experiences with people who are different from you? I believe the more familiar we become with diversity, the more likely we are to approach strangers with curiosity rather than fear. The more friends we make with people from different countries and cultures, the more understanding and compassion we will have for those differences. In a world where people have many different friends from all over the globe, what do you imagine will happen when conflict arises? Will we react towards our friends with fear and anger, or with a desire to understand them and find a peaceful resolution? I think that with each inspiring experience Couchsurfing helps create, we move ever closer to achieving our vision of a better, more understanding world. But, creating inspiring experiences isn’t always easy. My trip to Egypt was so wonderful that I thought all travel would be like that. I visited a many US and European cities in the early part of 1999 and found it difficult to make any connections. I left feeling unfulfilled. It turns out I had been very lucky in Egypt — inspiring experiences don’t just happen. I realized then that it takes the right combination of people and activities to make them inspiring. Is it possible for Couchsurfing to do this on a scale large enough to reach our vision of creating a better world? I’ve been asking myself this question since Couchsurfing first launched back in 2004, and I believe we can. 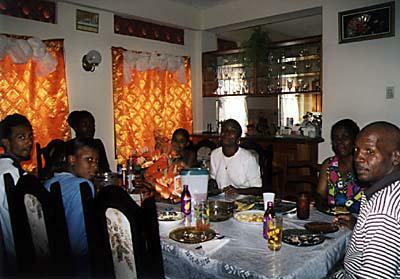 In 1998 I spent ten days over Christmas in Trinidad and Tobago with a friend whose mother had fled to the US seeking asylum, and had never been back. My friend was born and raised in New York, and had never met her family that lived there. She was eager to spend time with her grandparents, but the islands of Trinidad and Tobago were not very safe, and she was concerned about going alone. Having recently ended a long relationship, I was feeling lost and empty. I had been feeling like this for a while and was unsure of how to move on. I knew when my friend asked me to join her on her trip that it was the perfect opportunity to get out of my normal space. When I arrived I was told that I must stay with a member of her family at all times as it was too dangerous for me to be alone. As if to illustrate that fact, there were bars on nearly every window of every building. We stayed in the house of her grandmother who I was told practiced voodoo, and who assumed that we were getting married. We were so shocked by her assumption that we didn’t immediately correct her, and the rest of the family thought it best we keep quiet. I was surprised that simple friendships between men and women weren’t as readily understood or accepted as I was used to, and it made me wonder how different my life at home would be if my friendships with women were restricted. I had other surprises in store too. When I tried to take a shower I learned that the public water would only come on at certain times each week and didn’t follow a strict schedule. My hosts tried to store as much as they could in buckets for to use later. When I was very young my family had lived in small wooden house that had few amenities by today’s western standards, but we were lucky: even though it had often been cold, we always had running water. Also, they celebrated Christmas in a very different way to what I was used to. There was definitely no mashed potato and candies yams! The food was special, local food that was unlike anything I had ever eaten before. Even though my friend’s family were surprised and curious about my vegetarian upbringing, there was still plenty of options for me to eat, and it was fun comparing our cultures and customs over the diner table each night. My friend’s grandfather drove us all around the island of Trinidad in a small, old, Eastern European car. It was made up of remnants of other cars, long since retired to the scrapheap, and had probably been rebuilt many times over the last decade. He enjoyed showing us around all his favorite places that he had known all his life, such as hidden caves, beaches, waterfalls and the ancient tar pits that the island was known for. One day, on our way into the main town of Port-of-Spain, we drove past some shanty towns. I had never seen shanty towns before and thought they looked like a really bad way to live. They were very busy and chaotic. I asked about them, expecting my friend’s family to agree with me on their condition, but they replied that “it was just like that for some people.” I got to thinking about the different things we get used to, and how easy it is sometimes to get used to conditions that other people might find shocking. About halfway through my stay there we took a six hour ferry to get to the island of Tobago where my friend’s aunt lived. 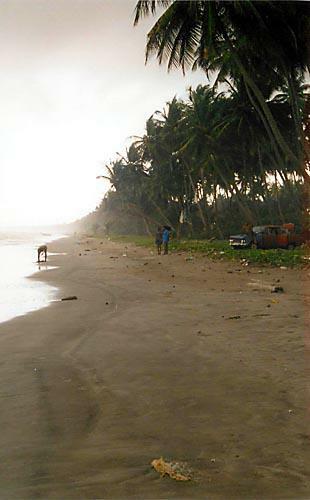 Tobago was much smaller and safer than the island of Trinidad with many more holiday resorts. It definitely felt more easy-going. My friend’s aunt was a well-known and respected woman and seemed to know everyone on the island. So many people on the street would stop and talk to us that it felt like being in the company of a celebrity. I was quite shy so I was really thankful that she was so sociable. She introduced us to everyone and they were all interested in where we were from and what we were doing during our visit. Staying with a family that lived in Trinidad & Tobago gave me access to the people and culture in a way that I never would have had traveling alone. The safety concerns on the island of Trinidad probably would have made it difficult for me to go there at all had it not been for my friend. In Egypt my experience had been amazing but at the time I hadn’t completely known why. In Trinidad & Tobago I was starting to realize that it was because I was able to get an understanding of the way of life there. I was able to ask questions about every single thing that interested me, in the moment that I was experiencing it. As a tourist I wouldn’t have been able to do that. As a tourist I wouldn’t have had anyone to provide me with the context necessary to help me understand what I was seeing. This trip, along with many others, taught me something else as well. It taught me that travel can give you perspective and be therapeutic. I was able to temporarily step away from the challenges in my personal life and see the world from a completely new angle. I was able to begin to see that my problems, while important to me, were really quite small in the grander scheme of things. Looking at my life from an outside perspective allowed me to grow as a person. Have you ever experienced a similar situation? Experienced travel as a way to gain perspective and work through a difficult point in your life? If you feel like sharing, I would love to hear your story.